Sometimes, life happens – and you don’t have the cash to cover an emergency cost. Whether your water heater has sprung a leak, your car needs to be repaired, or you’ve run into an unexpected medical bill, a payday loan with quick approval or a cash advance can be a useful way to get the money you need and get your finances back on track. If you’ve never taken out a payday loan before, you may be a bit intimidated when applying for a first-time payday loan. But there’s nothing to worry about. As long as you do a bit of research and stay informed, you can easily take out a payday loan without worrying about sky-high fees, and overage charges. In this guide, we’ll discuss some of our top tips for looking for a first-time payday loan. A first-time payday loan is not a good way to get extra cash to do things like buying the latest iPhone or funding a vacation. Payday loans are for emergencies. For example, if your car breaks down, you may not be able to get to work. If you can’t get to work, you could lose your job. If you don’t have the money to pay for the repair out-of-pocket, a payday loan online is a reasonable way to get some quick cash and make it to your next payday. Why should payday loans only be used for emergencies? Because the fees are quite high, compared to a traditional loan. You may pay as much as $30 per $100 you borrow, from some lenders. Because of this, it doesn’t make financial sense to take out a payday loan for anything other than a serious emergency. Beyond this, each lender may have different requirements. Some lenders may require you to make at least $1,000 per month, for example, or do a background check. As a rule, though, if you can meet the above three requirements, you’ll be pre-approved for a payday loan. There are hundreds of different online payday loan companies out there, and each one offers different rates, has different fees for taking out cash loans, and has different policies related to qualification. If you shop around for a payday loan and see what each company is offering, you may be able to get a better rate on your emergency cash loan. If you can’t repay your payday loan, you could face serious late fees from the payday loan company, or even risk having your bank account over drafted – leading to hundreds of dollars in bank fees, which are unlikely to be refunded. Before you take out a first-time payday loan, make sure you have a complete understanding of the fees you’re paying and what fees will be charged if you don’t repay it on time. We’ve said it already, but it’s important, so we’ll say it twice. 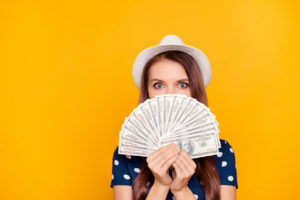 Sometimes, after taking out a first-time payday loan, some folks get used to being able to get extra cash whenever they want it – and they take out more payday loans whenever they want. In the long run, doing this can cost you thousands in lending fees. So, get a payday loan when you really need it – but avoid doing so when your purchases could wait until your next paycheck. Apply for a Payday Loan Today! If you’re interested in a first-time payday loan, National Payday is the best choice. With fast approval and payments, reasonable rates, and a simple online application and qualification system, you’re sure to be approved and to get the cash you need. Start your first-time payday loan application online now!